Well, what can we say. This is the most important supply when creating your patterns. One can make certain patterns without having a loom, but elastic bands are a necessity. Some people call them "rubber bands", and others call them "elastic bands". In my videos, I call them elastics or elastic bands. The definition is an elastic loop made of natural or synthetic rubber. 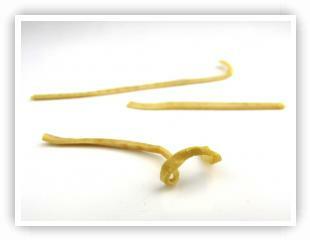 Other acronyms for a rubber band is a binder, elastic band, lackey band, laggy band or elastic. In this article, we will list all the unique properties or characteristics of the rubber bands, and what various manufacturers are doing to make their bands unique. By far, color is the property that is the most varied, and most sought after by loomers. It is very rare to find a pattern or a piece of loom jewelry made with only one color. There are dozens of colors to choose from. 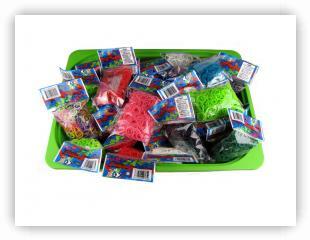 From Rainbow Loom, in Opaque, they have Cocao, Mango, Skin-tone, Fuchsia, Neon Green, Teal, Neon Orange, Black, Orange, Grey, Dark Green, Olive Green, Lime Green, White, Burgundy Brown, Navy Blue, Ocean Blue, Turquoise, Yellow, Caramel, Red, Pink, Purple, Deep Purple. In Jelly colors, many are similar to opaque, but they also have clear, gold, silver, tie-dye. Similar colors with their Silicone rubber lineup, including some metallic colors as well. 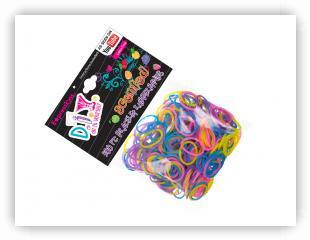 One can purchase packages of rubber bands in individual colors, but also assorted colors. One manufacturer combines colors in themes, such as "Patriotic", with Red, White, Blue. Another theme is mixed camoflage, with beige, brown, green and black. Since colors make these jewelry pieces unique, manufacturers have "stepped it up a notch" by creating multicolored bands. 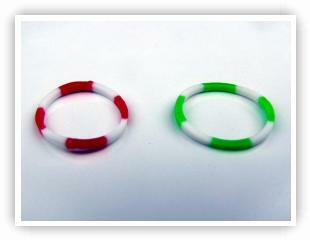 These bands may have only two colors, and these are called "two colored bands". One can purchase these bands with half the band being one color, and the other half being another color. Manufacturers also alternate these colors multiple times to produce a pretty neat looking rubber band. Others have more than 2 colors, and these are called tie-dye. Why stop at 2 colors. Others have more than 2 colors, and these are called tie-dye. Another two-color strategy used by manufacturers is a technique called dual layer. These bands have an outer layer of one color, and an inner layer of another color. The outside color is predominant with dual layer bands on bracelets or other jewelry. The name of the band, that is, "rubber band" implies that it is made of rubber. This may not necessarily be the case. 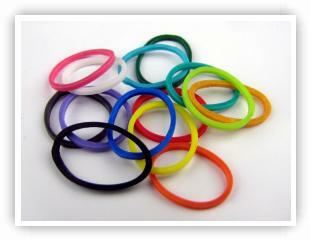 Rubber bands could be made from natural rubber, synthetic rubber, silicon or latex. Some bands are latex free. Depending on the material, bands have different properties. Some are more stretchy than others. Some are more squishy than others. 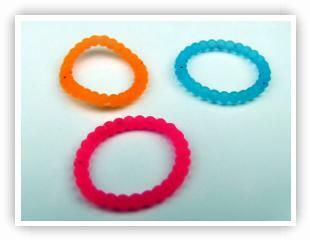 One can usually tell the material from the name of the color of the band with some manufacturers. 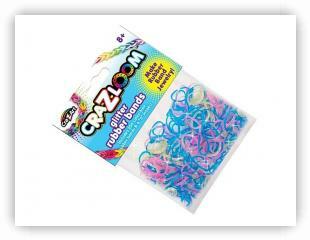 For example, Rainbow Loom creates Opaque Yellow, Jelly Yellow and Silicone Neon Yellow. Each of these bands have different properties and resiliences because of the materials they are made from. 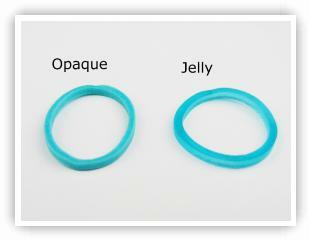 Jelly bands are transparent and more squishy. Silicone bands are less stretchy, but more resilient to staining and the elements. Some manufacturers are adding scents to their rubber bands. 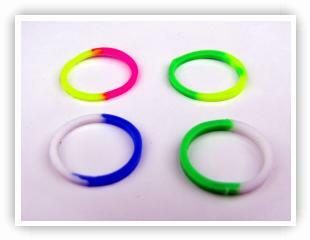 One cool effect many manufacturers are creating are Glow-in-the-Dark bands. After all, you will be wearing your jewelry when it gets dark, so why not make it stand out some more by using Glow-in-the-Dark elastic bands. To make a band even more "sparkly", manufacturers are mixing in sparkles into the band and these are called Glitter bands. One creative manufacturer has created sunlight activated bands. 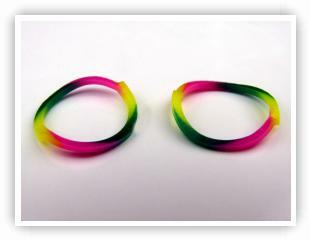 These bands are one color when out of the sun, but change to another color when exposed to sunlight. 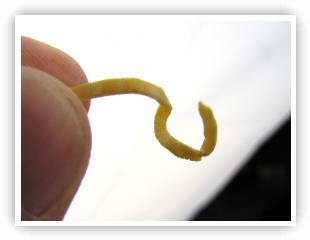 When rubber bands are manufactured, a rubber tube is sliced into desired widths. This give each band a square look if you cut the band in half and look along the end of band. 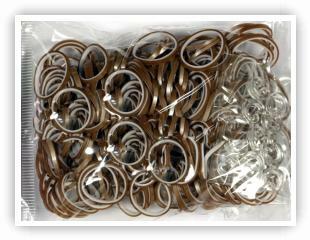 Other bands are produced similar to O-Rings, where they are round if cut in half. Most bands have a continuous shape along the band itself. Some manufacturers are changing the shape of the band with a bobbly appearance. As with almost any product on the market, different manufacturers use different techniques, materials and production methods to get their products into the hands of their consumers. As such, there are different prices for elastic bands. You may have heard the expression "you get what you pay for". I personally find this true with elastics. The cheaper ones are cheaply made. 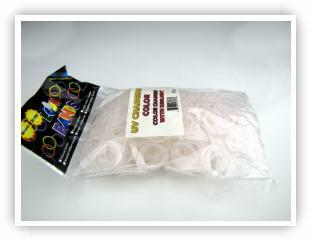 Some elastics are not cut evenly, so they are thin in places. Some have inperfections, which can cause them to snap at the weak spot. As mentioned above, the material a band is made from can effect its quality. The newer silicone bands are being promoted as "They are stain-resistant, very long lasting, and impervious to almost any liquid or environmental condition." This statement implies that the first generation of elastics have problems with staining, and effected by liquids and environmental conditions such as sunlight and temperatures. Nothing lasts forever. One sad fact about jewelry made with loom products is that over time, the elastic bands wear out, and depending on material, some bands will wear out sooner than others. Rubber oxidizes. What this means is that when rubber is exposed to oxygen, they slowly deteriorate. You don't even need to be wearing your jewelry, and it will be deteriorating away just because it is sitting on the shelf exposed to the air. This deterioration is accelerated when the rubber is exposed to sunlight and the elements. With many patterns, if one elastic breaks, the entire piece of jewelry will start to unravel. There are many factors which will determine how long your elastics bands will last. Exposure to the elements (sunlight, weather changes, oxygen). How often they are stetched. How often are they immersed in water. What type of water (ocean water, bath water with soap). Sweating. Sunscreen. Makeup. This is just a partial list of things which could effect the longevity of your bands, and of your jewelry. The recent introduction of silicone rubber will make the elastic bands last longer, therefore making your creations last longer as well. Tips: Store your jewelry in a sealed bag to prolong its life.